Are you planning a party or special event? 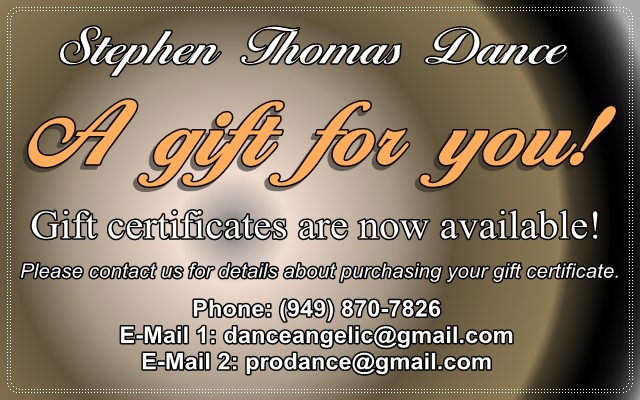 Stephen Thomas Dance will provide Party Entertainment for any occasion! Birthdays, Weddings, Corporate Functions, Holidays, Chruch Groups, Fundraisers, Reunions, Special Occasions, or Just for Fun! Please contact us for a no-obligation FREE quote. Our professional Party Entertainers will entertain you and your guests to deliver bring fun and excitement to your special event or corporate function! Stephen Thomas Dance is dedicated to providing you with a night of fun-filled dance entertainment and party success that will surely wow your guests! Your party, special event, corporate function etc., will not just be ANY party. It will be a party to remember! Private Parties and Corporate Events... No event too big or too small! We've done them all! We are International dancing performers and entertainers available for shows and demonstrations at any type of private party, social gathering, corporate or cultural function, special event or party in Los Angeles, Orange County, San Diego and all areas of Southern California. We have over 30 years combined International, professional performing and entertaining experience and our resumes are extensive, including being National Dancing Champions, and performing at major International events all over the world! Our event and party entertainment services also include a short group class session (available upon request) for those of you with adventurous guests! Our services are available direct to the public, special event planners, party planners and wedding planners. We perform all the Latin, Salsa and Ballroom dances you see on the BBC's Strictly Come Dancing and the US ABC (American Broadcasting Company) television show, "Dancing With the Stars", to the highest international standard. All of our shows are choreographed with a mix of all the current, popular dance moves, tricks, spins and dips, as well as slow, sensual and romantic themes. We also have a variety of costumes, themes, styles and music selections to help make our shows really come alive! and let's discuss your party ideas!